Mesopeel is the most advanced range of specific chemical peels. High quality solutions that are safe, efficient and easy to control. Mesopeel enables the treatment of aesthetic concerns such as hyperpigmentation, skin aging, acne, stretch marks and other skin imperfections. 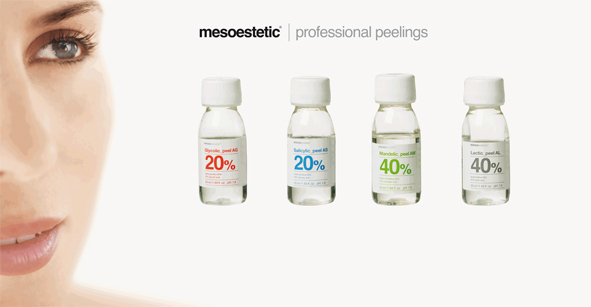 Mesopeel enables professionals to select the most suitable peel and its concentration individually to fine-tune the effects of exfoliation, session after session. Mesopeel products are combinable and can be administered as multi-layers in a single session, or can be applied over consecutive sessions. The cosmelan method has been designed to attenuate/eliminate blemishes caused by excess melanin in the skin. The cosmelan method acts within cells responsible for skin pigmentation , decreasing colour production in areas where excess production is apparent to achieve the disappearance of attenuation of unattractive skin blemishes. What benefits does mesopeel offer? Mesopeel achieves an accelerated skin regeneration in a controlled manner. It causes the elimination of the external layers of the skin and enhances its physiological and mechanical characteristics achieving unbeatable, progressive results for facial and body treatments.